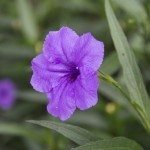 I planted Ruellia in several places in my landscaping and yard. I have a large patch in my backyard and just a few plants in other areas. I live in Florida and since planting (about 18 months ago), I had beautiful blooming plants. This spring I have no blooms at all. Not in the large patch nor the smaller patches (some have only 2 plants). What happened and how can I fix this? Thank you. Different cultivators will bloom better then others. Do you know the variety you have planted and it's characteristics? Also crowding of the plants can inhibit blooming. If plants are crowded you can thin them out. Also temperatures, many cultivators love to bloom in the heat of summer. You may want to try an application of a bloom-boost fertilizer.